Through actively seeking the collective wisdom of all residents, including those whose voices are often missing, Community Heart & Soul brings people together to build stronger, healthier and more economically vibrant small cities and towns based on what matters most to everyone. We devoted more than a decade working with small cities and towns to develop a community development model that empowers residents to shape the future of their communities. Community Heart & Soul fosters teamwork, engagement, and energy from within the community. Community Heart & Soul is a catalyst for positive change that provides a roadmap for small cities and towns to build a brighter future based on what matters most to everyone. Community Heart & Soul works because the community works together to make it happen. Lay the Groundwork: Build a solid foundation by identifying partners and leaders, spreading the word, and developing a road map for successful Heart & Soul community engagement. Explore Your Community: Gather residents’ stories and build relationships across divides. Identify what matters most, which leads to creation of Heart & Soul Statements. Examine how Statements are affected by community trends and conditions. Take Action: Partners and residents work together to take action and ownership. Heart & Soul Statements are applied to future decision-making and become part of the fabric of the community. From Down East, Maine, to the Heartland, to the Pacific Northwest, Community Heart & Soul projects are underway creating positive change that is resident-driven and recognizes both the unique character of a town and residents’ deep emotional connection to where they live. 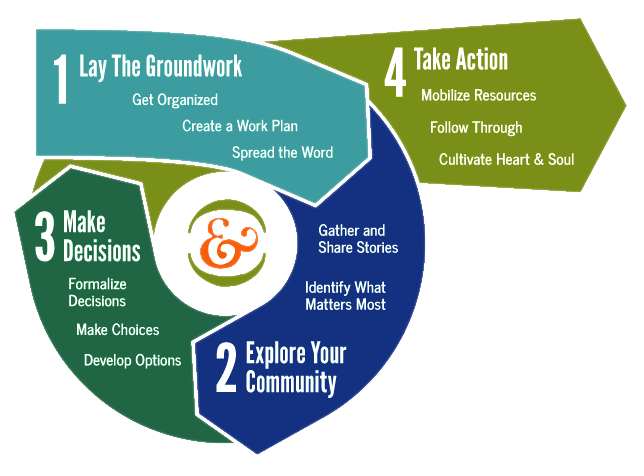 If community development and decision-making based on what matters most to everyone sounds like a great idea, and creating plans that lead to action sounds like the way to go, then let us connect you with resources to learn what it takes to get started.